It's not just a maintenance plan. It's a promise. If you have a Toyota, you need Toyota Forklift Support 360! Toyota Forklift Support 360 is a promise to be your full support forklift supplier from the moment we first begin a conversation and throughout the entire life of your ownership. 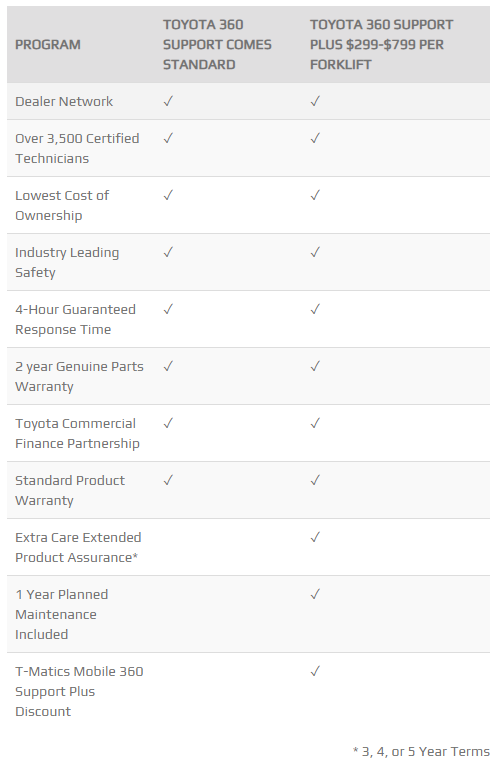 With Toyota Forklift Support 360, you’ll get the Toyota advantage of Toyota’s Certified Technicians, Toyota Genuine Parts, Toyota standard and Extra Care Warranty programs, Optional T-Matics Support, and the Toyota Mobile Service app. Request a FAST & FREE quote today! Up-time is key to keeping your operations running smoothly. 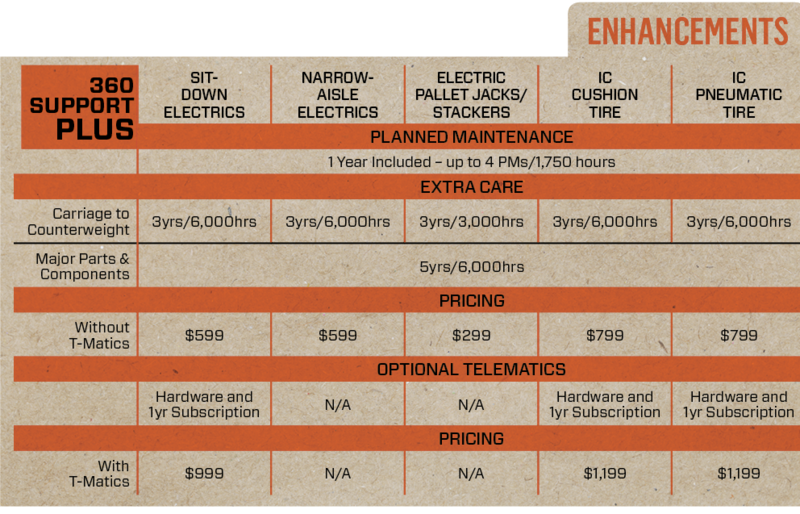 Expert technicians, four-hour guaranteed response times, and a standard warranty that promises what gets fixed will stay fixed. By upgrading to Toyota Forklift Support 360 Plus you get a year of planned maintenance included and an extended product assurance guarantee. Toyota Forklift Support 360 Plus is limited to clean operations. Foundries, cement plants, lumber yards and corrosive operations, etc., are excluded. TMHU reserves the right to determine the eligibility of all applications. THD Trucks are not eligible for Toyota 360 Support Plus. Servicing dealer will provide first hour of labor free if 4 Hour Emergency Response Time is not met. Some restrictions, including unavoidable delays due to traffic, acts of God, travel of greater than 50 miles from the nearest Toyota Service center, or customer not requesting emergency response. Guaranteed only during normal business hours. Please see dealer for details.